Brother Raymond L. Fitz, S.M., past president of the University of Dayton, will receive the prestigious Rev. Theodore M. Hesburgh, CSC, Award for outstanding contributions to Catholic higher education. Fitz, the longest-serving president in school history, will receive the award Jan. 31 in Washington, D.C., during the annual meeting of the Association of Catholic Colleges and Universities (ACCU). University of Dayton President Daniel J. Curran nominated Fitz for the honor. "Bro. 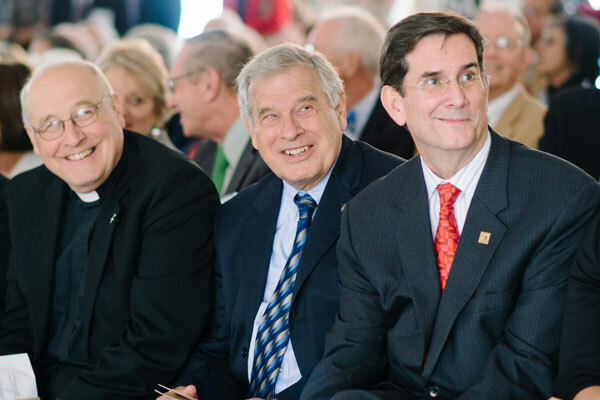 Ray's contributions to Catholic higher education are both local and global," said Michael Galligan-Stierle, president of the ACCU. "He lent his insights to the Vatican as a U.S. consultant during the drafting of Ex corde Ecclesiae; he informed the writing of the Application of Ex corde Ecclesiae in the United States; and he has significantly transformed the University of Dayton. "Given the range of his accomplishments, Bro. Ray's humble posture remains," he said. "When you are around him, you realize that his Marianist formation has taken root in a substantive way. Like Mary, he has made a fundamental contribution to society by simply saying 'yes' to what has been asked of him. This faith-filled contribution within Catholic colleges and universities has produced a deep embrace of Catholic identity within the academy and society." Fitz served as president from 1979 to 2002. His twin abilities to think boldly and empower people led to remarkable growth during his tenure with dramatic gains in the operating budget, endowment and sponsored research. An engineer by training and a deeply humble and spiritual man, he is known for his systematic, persistent approach to addressing complex community issues. "I deeply appreciate Dr. Dan's nomination and the ACCU board for selecting me for this honor," Fitz said. "I am even more thankful for all who were part of our great UD team." In the 1990s, Fitz chaired Montgomery County's Child Protection Task Force after five children in Dayton's child welfare system died. Through work with the Dayton Public Schools' Neighborhood School Centers and urban Catholic schools, he focuses on partnerships that create opportunities for young people to succeed and families to flourish. For the past dozen years, he has served as the Ferree Professor of Social Justice at the University of Dayton, where he provides leadership on community boards and teaches classes that connect Catholic social teaching to urban social justice issues. In October, the University dedicated the College Park Center as Raymond L. Fitz Hall. The Fitz Center for Leadership in Community, also named for him on campus, educates students to be servant-leaders. Every year, the Montgomery County Human Services Planning and Development Department gives the Raymond L. Fitz, S.M., Ph.D. Award to a front-line agency worker or grassroots community member "who exemplifies Brother Ray's dedication and commitment to the cause of nurturing and protecting children."